For the social crowd looking to experience some fast and exciting sailing! Siska is one of the most comfortable maxi yachts in the Whitsundays with a rich racing history! See what it feels like to reach maximum speeds as you glide around the islands, heeling over to the power of the wind! Experience a fun social tour at sea with great company and fun crew members! There is never a dull moment on board Siska! Your exciting agenda allows for a visit to the famous Whitehaven Beach and Hill Inlet Lookout, a sensational snorkel over some of the best reefs in the world and of course, an evening full of fun after your action-packed day! When you are not exploring the islands, take advantage of the spacious deck which is perfect for enjoying speedy sailing, sunbathing or relaxing! Journey to the North Eastern side of Whitsunday Island to Whitehaven Beach. Whitehaven Beach is a massive 7kms in length and had the purest silica sand in the world, making it soft, cool and one of the most unique places in the world. While on Whitsunday Island, take a guided bush walk up to the ever-talked-about Hill Inlet Lookout to see the stunning swirling sands below that are not found anywhere else in the world. Don't forget to bring your camera as this will be a view you will want to capture forever! Not only will get you get to experience snorkelling in the aqua blue waters of the Great Barrier Reef Marine Park, but you will also get a first-hand viewing of the amazing marine life and coral species. The most renowned snorkel locations are at the Northern end of the Whitsunday Islands, typically around Hook Island and Hayman Island. The experienced crew on Siska will determine the best snorkel locations based on the current weather and tidal conditions to deliver you the best underwater experience possible! Siska's racing history is legendary! She came second in the Fastnet Race having sailed the last 300 miles with a broken boom. Siska won the Parmelia Race from England to Perth, which celebrated the 150th anniversary of the foundation of Western Australia. It is estimated that Siska has sailed around 140,000 nautical miles from its launch until arrival to the Whitsunday Islands in December 1992. During this time, Siska won two Sydney to Hobart Yacht Races along with circumnavigating the world twice. HRH Prince Charles crewed on Siska when she set the fastest time defeating world champion Kioloa, and was first overall at Cowes in the Queen Victoria Cup against 329 other entries. Your crew will enjoy sharing many a tall tale with you, detailing Siska's amazing history. Siska has a myriad of winches and sailing gear that allow her to sail at top speeds. Guests can encouraged to assist on board, including hoisting and trimming sails, or taking the helm, but are also welcome to sit back and watch as the crew as you make your way around the islands! *Private Charter itineraries are flexible. 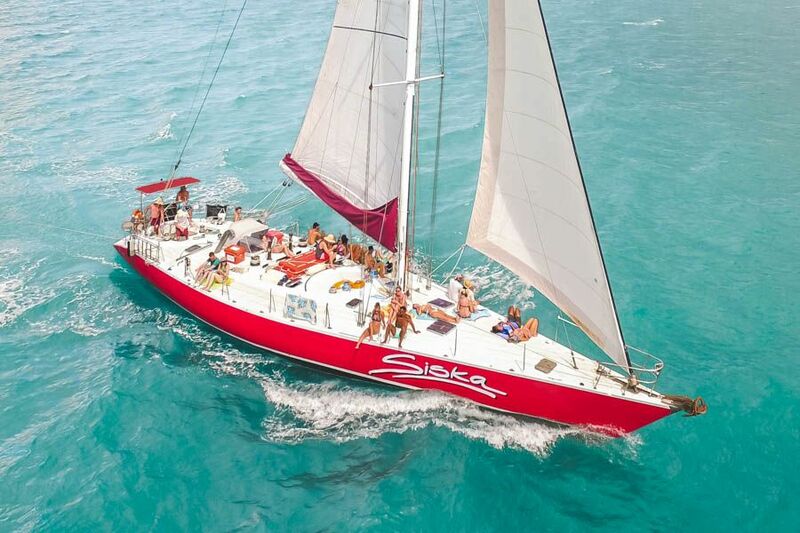 You can work with your crew to plan out your perfect holiday on board Siska! All accommodation is open-planned with shared amenities. Shared Single: Single bed (sleeps one person), usually a bunk bed. Shared Double: Double bed (sleeps two persons), usually with a single bunk on top. All meals are included while on charter. Please see the sample menu for a standard 2 Day, 1 Night charter here. Regular charters depart from Abel Point Marina in Airlie Beach. A Hamilton Island pick up and/or drop off is available, however, will incur an additional fee and affect the scheduled charter time period. Siska typically take ages 18+. Children 16+ may be accept if travelling with a parent/guardian.